We raise many different species of trout at our facility, here is an overview of the different types. For ordering information please download our quick quote form. 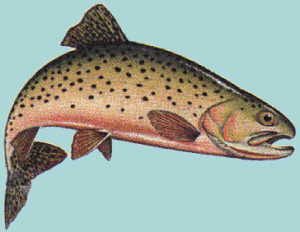 Cutthroat have a crimson slash on either side of the throat beneath the lower jaw. The spotting pattern is made up of black spots and red-orange spots inside light blue circles. Identifying marks are black spots on a light body and a red stripe along the sides of the fish. 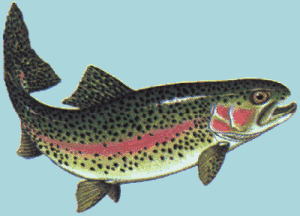 This is a hybrid between a rainbow and a cutthroat. Very similar in markings as the rainbow but has more spots than the rainbow and many times has the crimson slash beneath the lower jaw. The body is oblong with moderately large scales, while the head has no scales. There are three simple and seven branched rays on the dorsal fin. Grass carp are silvery to olive in color, lacking the golden hue of common carp, and they have no barbels.